Summary: Sarasota County hosts the highest density of sea turtle nesting on the gulf coast of Florida. The beaches of Lido Key, Sarasota County, are considered important nesting habitat for the threatened loggerhead sea turtle. South Lido Key Park, our project site, is a County managed natural area park that supports a large percentage of nesting on Lido Key. Beaches within the park are also used as a common relocation area for nests laid during active beach nourishment projects on Lido Key. Currently, artificial lighting existing in the parking area and near the public use facility is shielded by an extensive vegetative buffer of nuisance exotics. Recent efforts have been made to remove the exotics and replant the dune areas with appropriate salt-tolerant native plants. County staff have recognized the need to modify the existing lighting to compensate for the loss of vegetative buffer. The South Lido Key Lighting Improvement Project involves lighting upgrades, retrofit and replacement of multiple fixtures currently located at South Lido Key Park, Sarasota County. The project proposal includes the purchase, installation and field testing of four MoonCell Enviro-Lum fixtures, a full cut-off solar powered LED luminaire. Results: To promote safe nesting and hatching for turtles, parking lot lights using advanced technology were recently installed at South Lido Park. The new fixtures, funded by the Florida Sea Turtle Grants Program, harness 100% of their energy requirements from sun and wind. 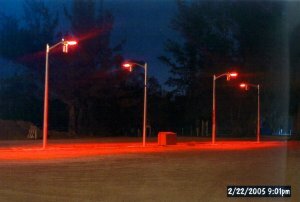 The red-orange LED light sources produce illumination levels comparable to standard high-pressure sodium fixtures without negative effects on human night vision while reducing the risk to sea turtles. Standard artificial lighting causes hatchlings to become disoriented as they try to make their way to the water and also deters female turtles from nesting.